These 3 bullet points present so many problems I don't know where to begin. Let's start with point 2 "Assume MSI is to be on-going". Assume? based on.. what? The province's MSI initiative is part of the "capital plan" and not the "operational plan" which means that to begin with the MSI money we're getting has been borrowed and the reason why? To help prepare for the influx of population we expect to be getting. So this assumption is based on the assumption that Alberta's economic situation can only get better, not worse, or if it does get worse that it will continue to borrow at the same or what will more likely be required greater rates than they are now. 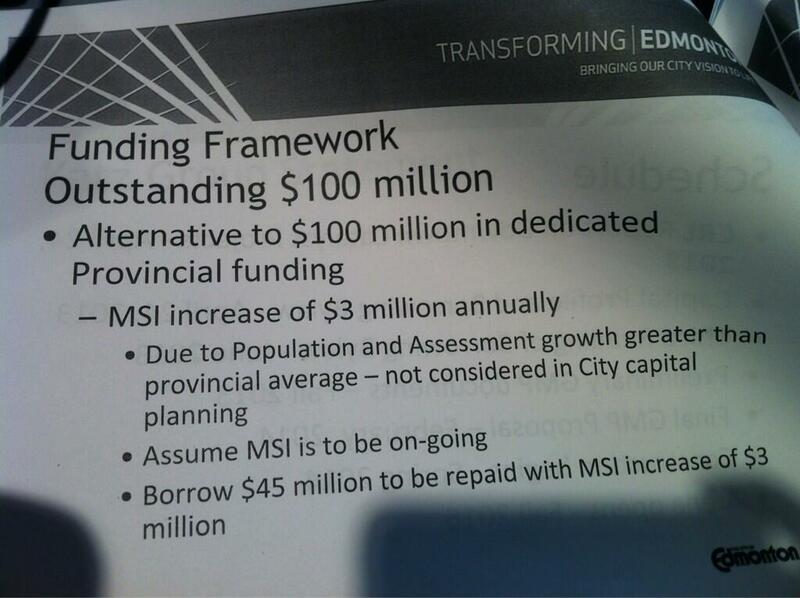 Edmonton is then going to get a loan of it's own of $45mil (seems we're still missing $55mil, but what-ev) which will be repaid with what we can only assume will be ongoing MSI funding levels (don't worry no cuts are coming in the future as sustainability fund runs dry). Attached to both of these loans is interest, so you are paying interest on the provinces loan and you will now also be paying interest on the city's loan which is to be serviced by a portion of the province's loan. Next year we can only assume the province will have to borrow more unless "things turn around" and the influx of population is apparently needed to do that. Quite frankly, the province is borrowing for the "capital plan" for a reason and we should be using it for that reason before it's no longer available. This is just the beginning of a long downward trend, do you think Alberta is going to continue being so liberal with it's borrowing in 5 years? 10?